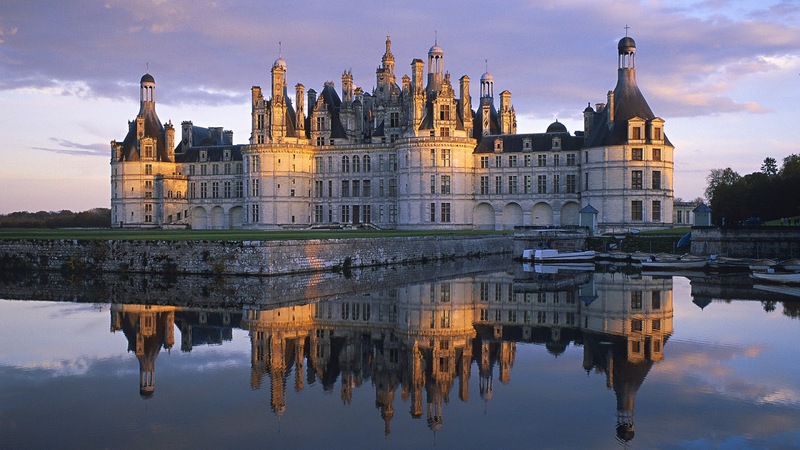 The glorious Loire Valley in central France is rich in history, architecture and cuisine. 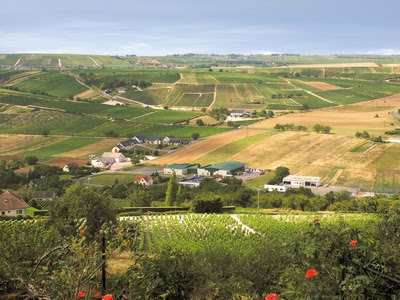 Its sophisticated cities, luxuriant landscapes, magnificent foods, and superb wines add up to a bourgeois paradise. Orleans was France’s intellectual capital in the 13th century, attracting artists, poets and troubadours to the Royal Court. But this medieval court was fickle, never staying in one place for too long, which led to the building of magnificent châteaux all along the Loire River. Because of it’s beautiful forests rich with game, the kings and nobility made this area the preferred habitat for their fairytale castles. Renowned for these regal relics, the lush Loire Valley is justly called the Garden of France. Famous for its vast array of remarkable vineyards, and fine wines, it is also home to a stunning diversity of the worlds most renouned goat cheeses. The quaint villages on either side of the Loire River produce a dazzling array of various sizes and shapes. Domestic goats contributed to the peak of the "Neolithic revolution", the period in history when humans ceased to live only by hunting and gathering and began to settle and develop agriculture . 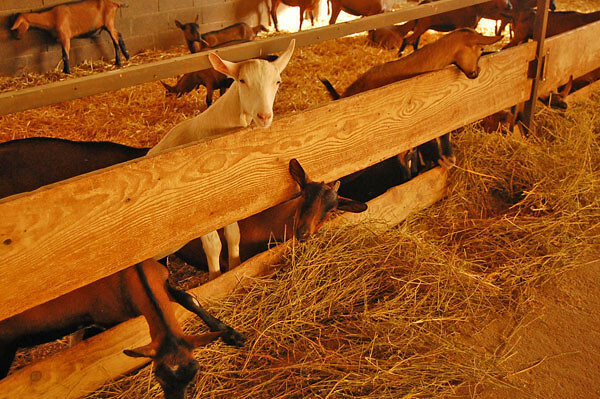 Among the first domesticated animals, goats differ from other livestock species by high genetic homogeneity on a global scale. Archaeologists and geneticists have shown that movements of domestic goats began as early as the expansion of farming, in the Middle East to Europe, 10,500 years ago. The process of making goat cheese was probably brought to France in the 8th century by the Saracens, inhabitants of the desert around Syria. Defeated at Poitiers, the Saracens were subesequently expelled from France, leaving behind their goats and the recipes for making incredible cheese from goats milk. There are over a 100 varieties of goat cheese in France, the majority of which are produced along the fertile banks of the Loire River. 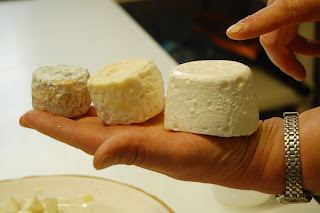 There are six AOC (Appellation d'Origine Controlee) cheeses in the Loire Region: Sainte-Maure de Touraine, Selles-sur-Cher, Valencay, Pouligny-Saint-Pierre, Chabichou du Poitou and Crottin de Chavignol. An AOC label indicates quality and guarantees that a product has been made within a specified region of France following established methods of production. There are currently 42 French cheeses with AOC status. Valencay cheese looks like a small black pyramid. It is purported that the shape of the cheese was originally a perfect pyramid. But when Napoleon returned from a disastrous campaign in Egypt he stopped at Valencay Castle, the cheese reminded him of the Egyptian pyramids and in a fury he chopped of the top of the cheese with his sword. The Valencay goat's cheese has a rind of natural mould, covered with salted powdered charcoal. Sainte-Maure de Touraine is a blue-grey mould covered long truncated log of goat's cheese. The cheese is mature, balanced, round with salt, sourness and an aroma of walnut. Selles-sur-Cher also has a rind of natural mould covered with powdered and salted charcoal. The pate is hard at first, then moist, heavy and clay-like as it blends and melts in the mouth. The taste is slightly sour and salty with a touch of sweetness. A glass of Sancerre or Pouilly Fume accompanies this cheese beautifully. Pouligny-Saint-Pierre nicknamed the Eiffel Tower or Pyramid because if its shape. The rind is of natural mould. The pate is a soft moist white and crumbly. The taste is at first sour and salty followed by sweetness. 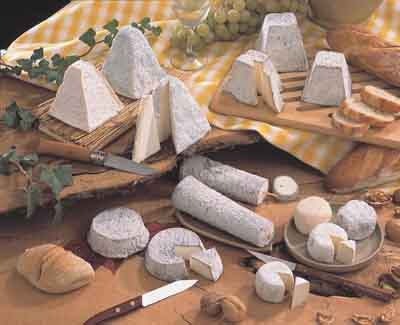 Chabichou du Poitou has a thin rind of white, yellow or blue mould and a delicate slightly sweet flavor. Crottin de Chavignol known as Chavignol is hard black and knobbly on the surface, and the taste is a balance of sourness, sweetness and a little salt. The three varieties of Crottin de Chavignol: (R to L) sec, demi-sec, frais. The "frais" or "fresh" is the most mild, while the "sec" or "dry" and older, has a stronger flavor.